At the start of February Awakening; the first of the four DLC packs for Call of Duty: Black Ops III was released. Along with four multiplayer maps there was also one map for the popular Zombies mode which was called Der Eisendrachen (German for The Iron Dragon). I won't go too much into the specifics of Zombies mode as I have done many posts about it (such as here), also this is just what I have discovered in the level, I am well aware there is far more to the map. To be perfectly honest I don't really understand the plot at all of Zombies, I have tried on several occasions but it is so convoluted that it makes my head fizz. Der Eisendrachen follows on from The Giant which itself was a remake of Der Riese, yet plot wise had been another chapter. 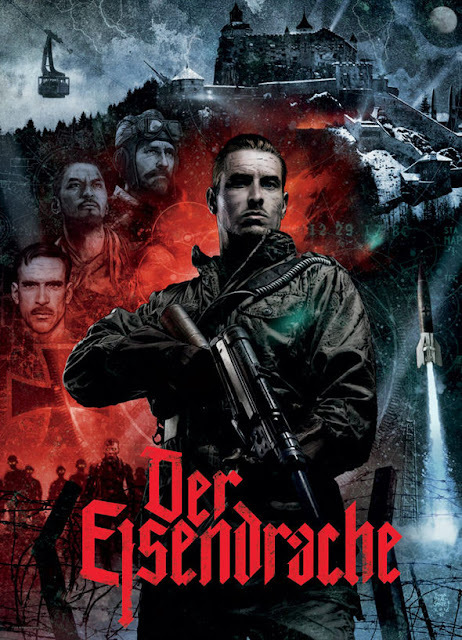 It starts with Richtofen, Nikoli, Takeo, and Dempsey piloting a giant robot, chasing down a Nazi truck that has on board another version of Dempsey (?). They eventually arrive at the mountain top Griffon Castle in Austria but arrive too late to retrieve the second Dempsey that they discover has been blasted off to the moon (!). They discover that Griffon Castle is yet another place over run with the living dead and so must battle them while trying to retrieve Dempsey. This new map is pretty large, apparently 50% bigger than The Giant which I can readily believe. You start off in a tram station and from this area you can go one of two ways, both leading to large outdoor courtyards. One of the courtyards leads to a series of highly detailed rooms, voice overs inform you this is where Samantha grew up (I believe she is a key part of the confusing plot), the other way eventually leads to a great hall. Once you have turned on the power the rest of the level opens up. There are battlements that link the two courtyards together, this area includes the death ray trap. The other area is the basement which is quite large. In this area there is a teleporter that takes you to a rocket launch pad as well as an anti gravity machine that when activated lets you boost jump and run on the walls. As is always the way this is a wave based survival game, each round brings with it more and tougher undead. After a set number of rounds you get dogs attacking you, here they resemble wolves more than previous maps. After around ten rounds a being wearing what looks like a diving suit turns up (similar to the special enemy from Origin). This being shoots electricity at you which stuns you, it also electrifies zombies around it but doesn't seem to be too hard to kill. There are three stone dragon heads in the level, if you kill any enemy near any of them they will come to life and eat the corpse. Eat enough and the dragon will crumble to dust, I have not yet managed to get all three dragon heads to crumble so don't know what the meaning of this is. Devices around the map propel you through the air to any landing pad you have activated which is kinda cool. There are some new weapons and Gobble Gum balls for this level which are retro actively put into the previous maps. 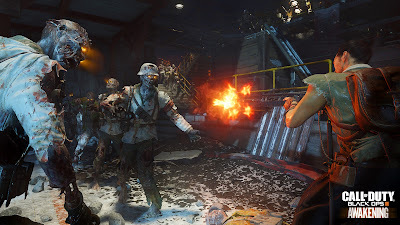 Occasionally zombies drop a Death Machine power up which for a limited time gives you a infinite ammo gatling gun, they also sometimes drop a fuse which can be used in the tram station to summon a tram containing a random power up. New Gobble Gum drops include one which makes all zombies move really slowly and one that makes all your shots count as head shots. The pack-a-punch machine in this map must first be assembled, there are three different spots where parts of the machine must be activated. There are parts you can collect to make up the zombie shield that was also in Shadows of Evil. 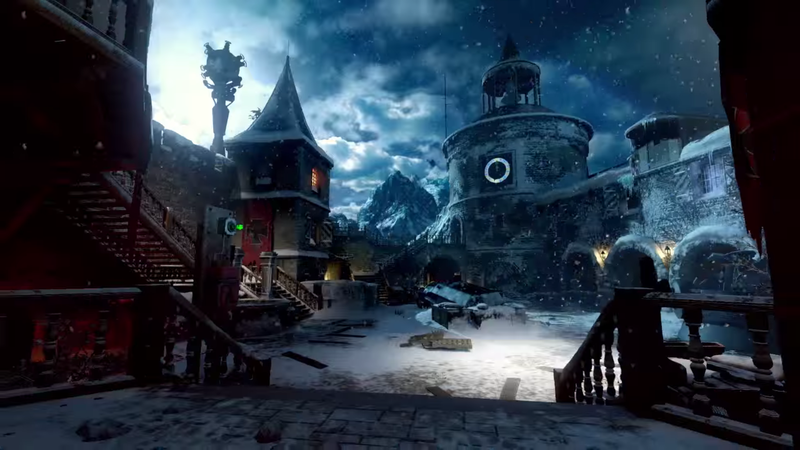 Der Eisendrachen is a fun map that reminded me quite a bit of something you would find in Wolfenstein. It is not as visually interesting as Shadows of Evil but the design is pretty solid and the new features plentiful. Nazi undead and a foreboding location in twilight makes for plenty of excitement, roll on the next map!